One of the most popular espresso machine designs among home enthusiasts is unquestionably the E61. Its gorgeously sculpted and highly polished group is recognized as a hallmark of fine espresso machines. The design of the E61 group earns its reputation as the heart of an espresso machine that is forgiving of minor errors in barista technique. This guides considers the latest rotary pump-equipped E61 model from QuickMill, the Vetrano, named after a gentleman from Milan who worked for Faema for forty years and now restores original Faeme E61 one and two group espresso machines simply for the pleasure. Knowing how to maximize the E61's forgiveness necessitates a certain understanding of how heat exchanger espresso machines like the Quick Mill Vetrano work; the article How I Stopped Worrying and Learned to Love HXs explains the easily mastered techniques of their brew temperature management. Even if you're familiar with this kind of espresso machine, I think you'll agree it is worthwhile prerequisite reading. On the other hand, if you're anxious to learn more about the Vetrano, feel free to bookmark it for later and then continue with First Impressions. The Vetrano arrived double-boxed with the inner container held firmly in place by foam corner supports and Instapak side inserts to assure no shifting of the contents. The Vetrano contained within the inner box is surrounded by custom foam pieces that together envelop the machine. It's easy to remove the foam inserts to reveal good grab points. If you're capable of lifting its bulk, you'll have the Vetrano on your countertop in minutes. The shipping department thoughtfully taped down the drip tray to prevent it sliding out during this maneuver. 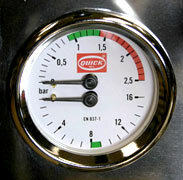 Dual pressure gauge; one for the boiler pressure and another for brew pressure. The Vetrano fits under standard-height kitchen cabinets with just enough room to allow for cappuccino cups on top. As a general rule before powering up an espresso machine for the first time, I remove its cover to check for wires and fittings that may have worked loose during the bumpy ride— the Vetrano checked out OK. The technicians had threaded some plumber's tape on the male fitting for the water hookup located on the machine's underside, so it required only a few quick twists to make the connection watertight. At the other end of the braided stainless-steel tubing is a 3/8" female John Guest push-in type fitting. The driptray setup is unique— it can be used as a regular manually emptied driptray, or optionally converted to drain directly into your house's waste water plumbing. As shown in the photograph to the right, the drainhole is located in the center of the driptray and the support beneath it has a U-shaped cutout that allows you to easily remove the driptray for cleaning. Most espresso machines in this price range have big rubber tabs affixed to the underside to keep the machine from skidding around, or blocky fixed-height legs. I like how the Vetrano's solid metal legs look and how they adjust. Turning the bottom section changes the height without compromising appearance. I used this adjustment to compensate for our off-kilter countertop and also to aid the draining of the plumbed driptray. The latter point— the level driptray —works to the advantage of those who don't wish to install a waste drain line, but means some water rests in the bottom otherwise. Other espresso machines with drain hookups that I've used skew the driptray towards its drainhole, i.e., they are intentionally not level. The instructions for the Vetrano are a modified copy of the Andreja Premium's. It covers the initial setup and provides hints and tips for those new to making espresso at home. Although I loath reading an owner's manual, the Vetrano's describes the key steps to setting up within the first couple pages. The instructions intoned that the boiler should auto-fill within 45 seconds. I noted the clock as it passed 30 seconds and the pump was still running. Then I realized how quiet - how blissfully quiet - the pump was. Quickmill did a nice job of securing the pump motor and surrounding components, plus they used high-temperature plastic inlet and outlet lines for the pump to reduce vibration transmission. Putting the claims of better clarity from a rotary pump aside for a moment, it's difficult to go back to buzzy vibratory pumps once you've grown accustom to their whispering counterparts. Once the boiler was filled and I had followed the rest of the first-time setup instructions, I let the machine warm up for a good half hour. The boiler's pressurestat setting was 1.1 bar at the top of the heating element's cycle. I double-checked the brew pressure was a reasonable 8.5 bar by activating the pump with a portafilter having a blind basket (no holes) locked into the grouphead. The enclosed instructions explained how to adjust the brew pressure. The Vetrano has three indicators to tell you what's going on. The leftmost green lamp is the power indicator; it's on whenever the machine is plugged in and the power switch is in the on position. The other two lamps are indicators of the boiler's status: Green means it's up to temperature and red means it's heating. Note the dual-pressure gauge is wisely marked with "green zones" for brew pressure (8-9 bar) and boiler pressure (0.9-1.4 bar).